Wish your Facebook page had better engagement? Do you want a way to get more post interaction without advertising? Using the Facebook Targeting for organic posts puts your updates in front of the people who are more likely to share, like or comment on them. In this article I’ll compare the results of using the Facebook Targeting feature for both a small and a large Facebook Page. You may be familiar with Facebook ad targeting, but did you know you can also target any of your posts to a certain demographic? Discover how to use organic Facebook organic post targeting. Targeting on Facebook posts has actually been around since the middle of 2012, but not everyone has used it. With the decline in Facebook page reach, post targeting may be a feature you need to start using regularly to get your posts in front of the right audience. In addition to general demographics (i.e., gender, age, relationship, educational status, location and language), there are a few more options for targeting your page posts. For example, you can target your posts to users who have specific interests. While the Interests option is more limited than Facebook ads, it’s still quite useful. You can also specify the time and day you want your post to stop showing organically in the news feed (this is the post end date). To use targeting on a post, select the target icon. With targeting, the only thing affected is who sees the post in the news feed. Only users with the target parameters will see the post in their feed. However, the post is still visible to everyone on your page timeline. If you’re sending the same type of post to multiple targets, you can always hide the posts from your timeline to avoid repetition. One thing to know about the Facebook Targeting feature is that you must target more than 20 people. If you have a small fan base, restricting your posts may bring you below the minimum requirement. 1. Click Settings. Make sure you’re in the General tab on the left sidebar (available to admins only). 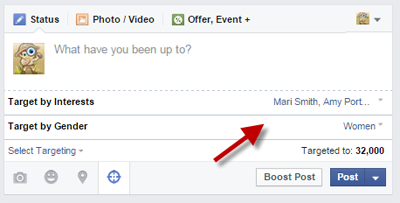 Enable targeting on your page. Back on your post, when you select a category to target, you either set your targeting choices right within the post area, or in some cases, a popup box appears to make your selection. If you want, you can select multiple targeting categories. You can select different targeting options. Only admins of the page will see that you have added targeting to the post—no one else will see the targeting options. 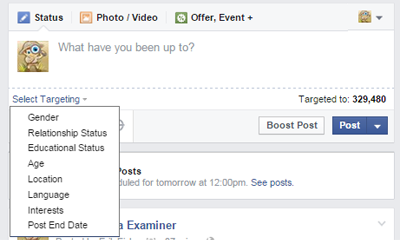 Social Media Examiner decided to test Facebook’s Targeting feature to see how it performed. I’ll share what we did and how we did it so you can replicate the experiment for your own page. Does targeting page posts lead to more engagement? Does one target group respond better than another? Does targeting work better for a larger page or a smaller page? Since we were interested in whether targeting would be more effective for a large or small fan base, we compared the Social Media Examiner Facebook page with a smaller page with a similar type of audience. Social Media Examiner has close to 330,000 fans and the smaller page has a little over 16,000 fans. 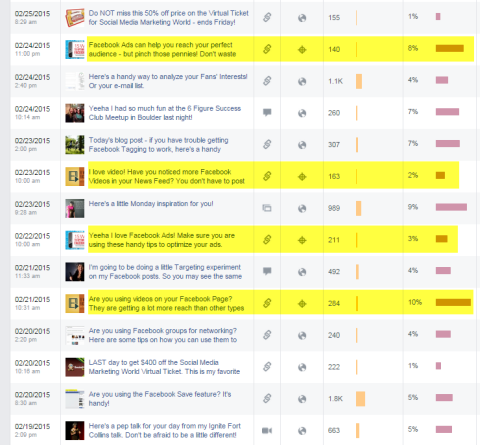 We used the same posts, same target interests and similar posting times on both pages to keep the test consistent. There are multiple targeting options. Image from Shutterstock. Choose the posts you want to target and test. You can choose new posts or successful posts you’ve already shared. For our purposes, we chose two posts about Facebook marketing: 8 Ways to Use Facebook Video for More Engagement and 15 Ways to Optimize Your Facebook Ads. Both were articles that had similar performance when previously posted on the Social Media Examiner page. We alternated articles each day so we wouldn’t overwhelm fans with multiple targeted posts. Next, determine what demographics and/or interests you want to target. Your Facebook Insights will give you a wealth of data you can use to decide which options you want. Type in the interests you want to target. Choose your own targets based on your audience and goals. After you’ve posted your articles to your target audiences, take a look at your engagement rate, which is the number of people who comment, like, share or click on a post divided by the reach of the post. 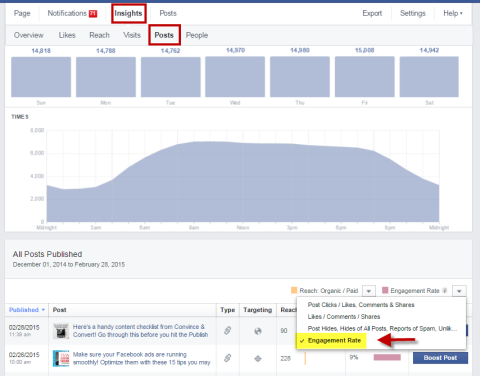 To find your engagement rate, go to Insights > Posts, then select Engagement Rate from the drop-down menu. 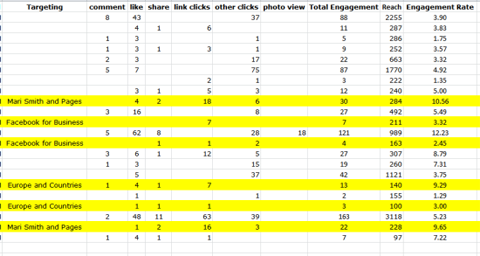 Compare engagement rates of your posts to get a more accurate picture of performance. With targeting your reach may be smaller, but the percentage of people who respond may be higher. Looking at the Social Media Examiner Insights, you can see that some targeted posts definitely had higher engagement than posts that didn’t use targeting. How did yours do? The posts that had targeting received higher engagement rates in some cases. Now let’s dive deeper to find answers to the questions we posed at the beginning of the test. To make it easier to analyze your results, download the data into a spreadsheet and take a look at the page post data. We had to do some rearranging to answer the questions we proposed at the beginning of our experiment, and you may need to as well. We realize that this experiment is just a sampling and not statistically accurate in terms of sample size. Use this exercise to show how you could do this experiment yourself. To find the answer, look at the average engagement rate over the week of your experiment. Ours was 4.25%. In the spreadsheet below, the posts we showed to the targeted groups are highlighted. Social Media Examiner’s engagement rate was in line with the other posts. You can see that many posts were right in line with the 4.25% engagement rate. Some of the targeted posts didn’t even result in less reach compared to the non-targeted posts. The smaller page did see higher engagement rates for targeted posts. But when we looked at the smaller page (the spreadsheet above), the average engagement rate was 5.33% and three of the six posts saw significantly higher engagement. For this question, we got some mixed results since we had such a small test group. For the groups we targeted, we found a higher-than-average engagement rate for both pages. The targeted groups did have higher-than-average engagement rates. The Europe and Countries target group was lower on the Social Media Examiner page, but it was higher in one case on the smaller page. 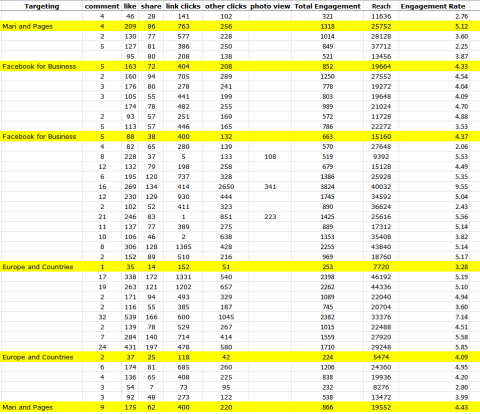 The Facebook for Business group was about average on the Social Media Examiner page and lower on the smaller page. Consider exploring this more for your own page to see if the results are higher. Results show the smaller page responded quite well to targeting. The Social Media Examiner page will continue to experiment. Go through your own results. If you maintain the same engagement rate or get a slightly better one, you’re coming out ahead. Using Facebook targeting is a free way to get more engagement on your Facebook page by showing your posts to people who are more likely to be interested in that topic. Continue to explore and try new things. 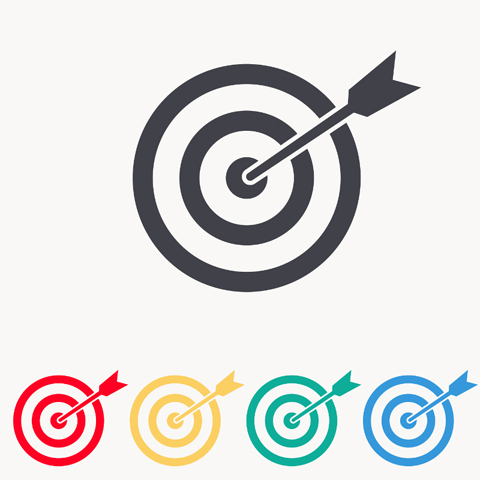 To reach your ideal customer, use targeting and see what results you get. What do you think? 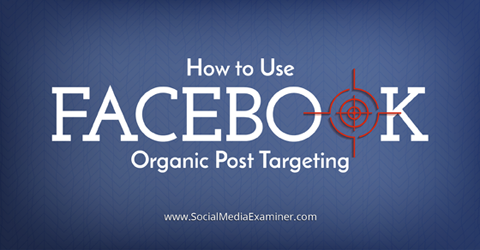 Have you tried Facebook organic post targeting for your posts? If so, what results did you see? Share your thoughts with us in the comments below. Target icon photo from Shutterstock.